Tomato paste is made from round and or pear tomatoes in a several stage process. Tomatoes are washed, sorted for quality, chopped, enzyme deactivated to preserve serum quality then strained to obtain the necessary juice for paste production. The strained juice is then evaporated under vacuum to a concentration of 24% Natural Tomato Soluble Solids (NTSS). 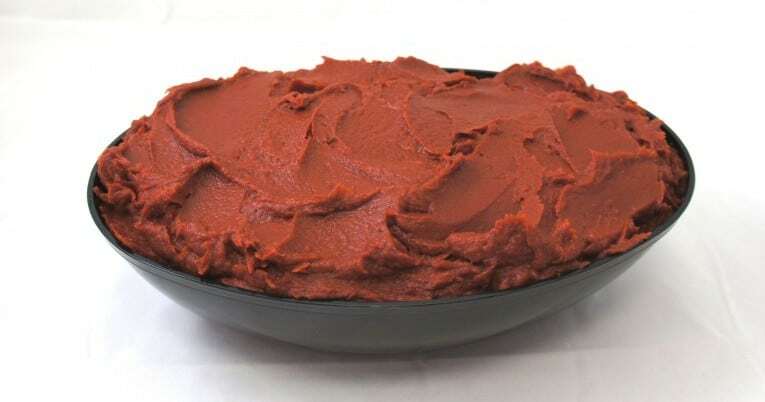 The finished paste has a bright red color and possesses a rich tomato flavor. The product is hot filled to ensure commercial sterility then cooled prior to stacking.